# What is the raw food diet? # Does your dogs diet affect its waste? # What to look for in a good dog food and where to find them? # And a lot more! This book will show you what ingredients you need to look for in a dog food and what ingredients you should stay away from. It will also help you decide what type of dog food be it soft, semi moist or dry dog food, be best for your dog. You can get Private Resell Right. 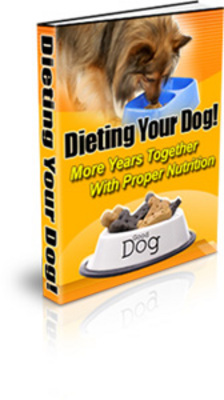 Dieting Your Dog Plr Ebook + Turnkey Website!